Italian artist Marco Dalbosco will present his acclaimed performance piece Scala 1:18 on Tuesday 14 December at London Metropolitan University. The piece was first presented as a parallel event at Manifesta 7 (Rovereto, Italy 2008) and is now being brought to London for the first time by SybinQ Art Projects. Scala 1:18 is inspired by the factory world, reflecting on the relationship between factory workers and the repetitive production process. 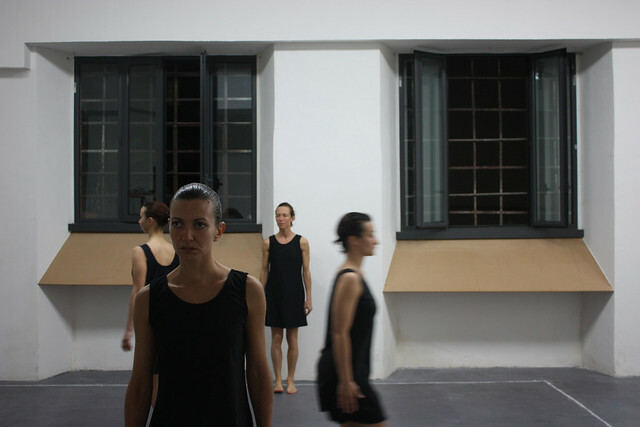 The performance involves five women, dressed and styled identically, moving according to an imaginary trajectory of threads being woven, against the backdrop of a video projection showing machines at work. The dancers become performing robots, repeating the same gestures, steps and sequences, unable to move beyond their starting point or change their predetermined trajectory. Scala 1:18 has been choreographed by Gloria Potrich from the CDM – Didactic Centre for Music Theatre and Dance, Rovereto, Italy. The performance will be accompanied by a catalogue, featuring an essay by Italian curator Roberto Pinto, and a separate text by Susanna Bianchini of SybinQ Art Projects.